Last weekend 2 franchiees from Husse Sweden arranged a second year of 'The Dog Party at Hagaparken'. 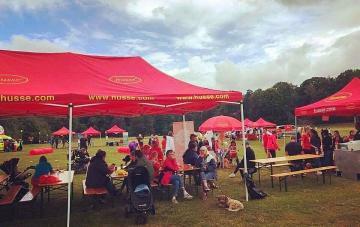 The event attracted more than a hundred local pets (despite very bad weather and rain) and was a joint effort between the local Husse franchisees and small local business within the pet indsutry, e.g. dog care, pet ambualce, dog trainers, agility clubs etc. A very warm welcome to our newest franchisees Jo & Tony who have taken over Husse West Wiltshire plus additional areas in Central Wiltshire to form Husse Wiltshire! We would like to wish them both all the success with their new venture! Last month, Husse UK ran a competition on Facebook offering pet owners the opportunity to post their favourite pet photo, with the winners to be decided by who receives the highest number of votes.